I really didn't know I would fall so much in love with Mexico. Growing up in the United States, all the info I had to reference of Mexico was what I pulled from news or the few Mexican people I knew working in the service industry. But sadly, it wasn't much. And to be honest, I was a bit nervous heading south on a bicycle about to spend at least 3 months in the country I knew so little about, but was sure to perish in. How far off base I was. Mexico is an incredibly vibrant place chocked full of beaches, mountains, parks, deserts, forests, with everything from remote villages to bustling metropolises. And have you looked at a map lately? See that giant country that borders the entire United States to the south and then stretches all the way down to Guatemala and Belize? Ya, that's Mexico. And it's huge! We biked down the Baja Peninsula and then ferried over to the mainland to cycle through the interior stopping in major cities such as Guadalajara, Mexico City, Puebla, Oaxaca, and everything in between. And as my husband and I ride south out of Mexico in the next couple days, I have compiled a list of the highlights of the journey through and tips from the locals we met of foods, drinks, and crazy things to try. Loreto, Baja Sur : The town/city itself was nice and quaint, but what we really loved and enjoyed was the area of coastline and beach to the north and south of Loreto. In the Bahia de Conception just north of Loreto, we found small beaches tucked into alcoves of surrounding hills, one after the other, where campers had pulled right onto the beach to stay and enjoy the views. We fished, we snorkeled, swam, had campfires, and saw everything from rays, dolphins, loads of fish and even heard how a few spotted whale sharks had made an appearance the previous day. South of Loreto, in Ligui, we discovered a long stretch of deserted beach that only local fishermen passed through to camp on and relax. The beach sits right before Highway 1 climbs steeply south up into the surrounding mountains. An epic spot to climb the rocky peaks, sit in the sand, watch dolphins swim by, and gaze at the surreal sunsets and sunrises as your thoughts float past. Lucha Libre : Otherwise known as Mexican Wrestling, this sport is revered in Mexico by young and old alike. Long before Jack Black, Nacho Libre, brought this sport into more of a spotlight in the US, Mexican kids play with their favorite luchador action figures, the colorful masks are sold all over Mexico, it's aired on National Television, and the luchadors are famous. There are only three places in Mexico to see Lucha Libre live; Guadalajara, Mexico City, and Puebla. We had the pleasure of making it to a live show in Puebla and let me tell you what, this is a show not to be missed! The women in the audience are known to heckle and swear worse than anyone (and I mean be warned if your kids understand Spanish, because the language in these places is downright faul), the girth these guys swing around the ring so flawlessly is quite impressive, and if you get the most expensive ringside seats (anywhere from $12-$20 USD) you just might literally get one of these hunks in your lap. Oh boy! 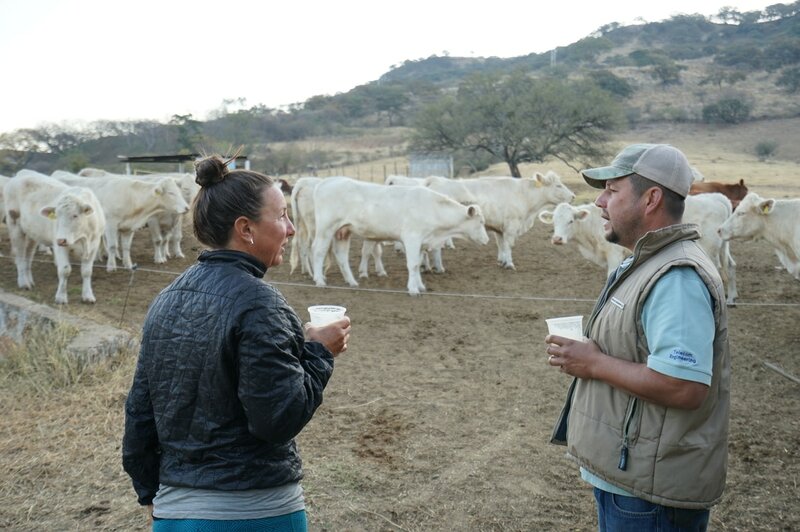 Pajarete : This might be a bit tougher to find if you just head to the big cities, because it is well known in the small farm towns and a big morning drink of choice for vaqueros (cowboys). First, you need a cow. A milking cow to be exact. You will need to get up early, to hit the golden hour of when she needs to be milked. And you might need to find a vaquero willing to put her in a pen to milk, not advisable to climb through a fence in a cow pasture to wrestle a cow to milk. Step two, take a big cup, put in a scoop of coffee (usually Nescafe), scoop of chocolate powder/pieces, scoop (to taste) of sugar, alcohol (amount desired) and put cup under milk cows udders, milk cow, fill cup, mix and chug. Repeat. What a fun Mexican treat! National Museum of Anthropology, Mexico City : This is by far one of the coolest museums I have been to in my life. The place itself is nestled in a beautiful park, wrapped around a giant cascading water feature and pond, with two floors packed full of Mexican history. It is so massive, you just might need at least an entire day or more to see everything (the place is nearly 20 acres large). The museum contains significant archaeological and anthropological artifacts from Mexico's pre-Columbian heritage, such as the Stone of the Sun (or the Aztec calendar stone) and the Aztec Xochipilli statue. One of my favorite exibits, was the bones from a Mammoth set in a room down into the floor with a clear plate allowing people to walk over the top of and peer down at the bones. I also was pretty blown away by the dentistry discovered in teeth of skulls (jade and gold fillings) dating back to the Mayans (before the 1500's). If you make a trip to Mexico City, put this museum on your list. Pulque : Everyone knows about Tequila, many know about mescal, but do you know about pulque? It is a low-alcohol contained beverage that is made from the fermented sap of the maguey (agave) plant grown mainly around central Mexico. In it's natural form it is the color of milk, thick in consistency with a somewhat sour taste. The drink itself dates far back into the Mesoamerican period, went through it's lulls in popularity and is making a comeback in Pulque Bars springing up around Mexico City and central Mexico. I understood that the liquid is sucked out of the plant and must be transported and consumed quickly because it goes bad and becomes undrinkable in a short amount of time. There is also belief that there are medicinal properties to the drink and that it is good for your stomach. Well, we had a swell time chugging pulque with friends out of bamboo steins and singing along to Mexican tunes by a random guitarist in a bar and I highly recommend adding this on your alcoholic beverages to try when in Mexico. Pack light, don't make concrete plans you can't change, keep an open mind, try everything and have fun! Mexico is a fantastic country, go explore!